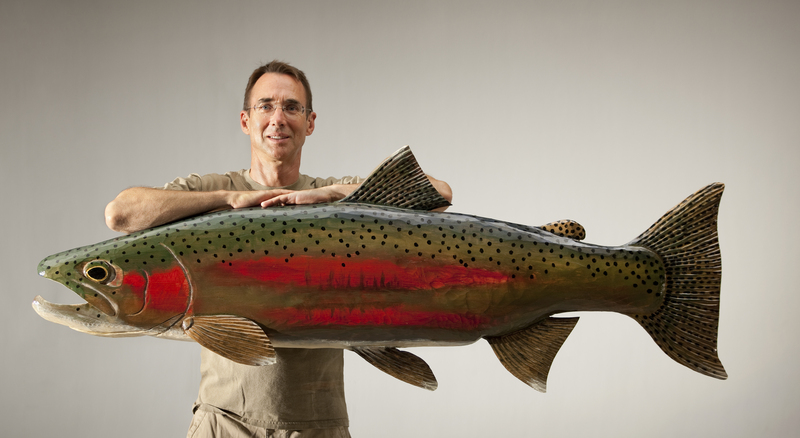 Bob Batchik created this giant steelhead carving as a commissioned work for musician Huey Lewis. The wood fish hangs over the front door of the musician’s California studio. Photo: Courtesy of Bob Batchik. SYLVAN LAKE, MI — Bob Batchik has long been hooked on fish and fishing: bluegills, trout, bass, pike and perch. He isn’t fussy. He likes them all – particularly if he has a carving knife in hand. 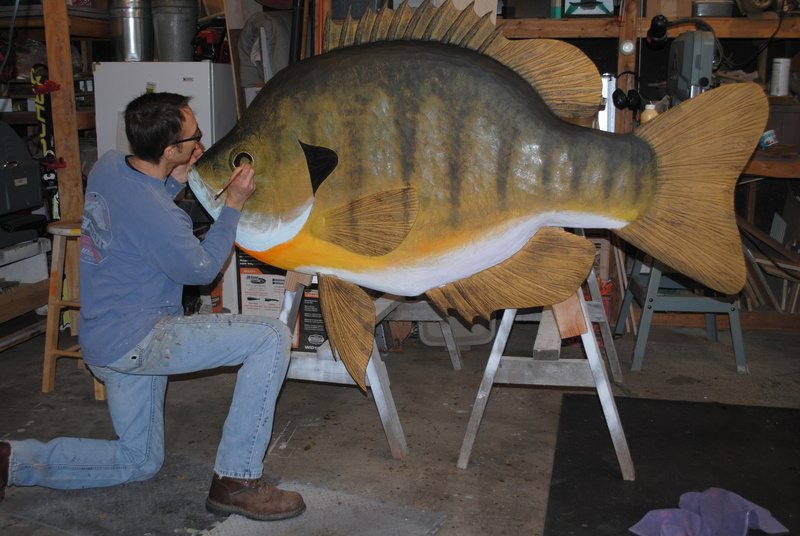 An avid fly angler and suburban Detroit graphic designer, Batchik has carved out a niche and built a business creating colorful, sometimes super-sized, fish carvings that become bold adornments for client’s gardens, fences, cottages and cabins. A larger than life steelhead he carved in 2012, hangs over the door of Huey Lewis’s California music studio. The popular musician found Batchik’s work on the Internet and commissioned him to create the fish. Batchik, lives in Sylvan Lake with his wife, Mary. He carves 25 to 30 fish every year, working in his garage woodshop. Some are highly detailed, custom creations. His website (sunfishwoodworks.com/) shows his carvings and creative furniture designs. They include fish rocking chairs and a glass-topped table with a massive carved wooden earthworm base, and benches and chairs to match. Wood carving began as a hobby for Batchik, during the years he worked for Xerox as a graphic artist. He chose in the late1990s, with the birth of his second daughter, to become a stay-at-home dad. Being at home, raising kids, was something he enjoyed. It eventually also provided him with time to focus on carving. Those might seem inauspicious beginnings for most – and Batchik’s carving interests might have gone no further were it not for his wife, who took notice. That Christmas she gave him a wood carving knife and instruction book authored by four-time world-champion fish carver, Bob Berry. Batchik followed the instructions and carved his first rainbow trout out of cedar. He was pleased with the outcome, but his second attempt was better. Once painted, his carvings began to sell: one here and there, at first. But, one he made brought in decent money and opened his eyes to the possibilities. Batchik, now a long-standing board member of the Paul Young chapter of Trout Unlimited, had agreed to donate one of his 12-inch carvings to the chapter fund raising banquet. It sold for $340 at the auction. These days, Batchik fishes every chance he gets. His kids are grown. He may fish for smallmouth on Sylvan Lake, or head north to Grand Traverse Bay to fly fish for carp and finish the day on the Upper Manistee River fishing for trout at night. He learned to fish as a young boy, going out with this grandfather and his dad. Their love of fishing stuck with him. He enjoys fly fishing, but will readily fish with spinners. He’s fished salt water and has thought about carving a tarpon. Just don’t ask him to go ice fishing. 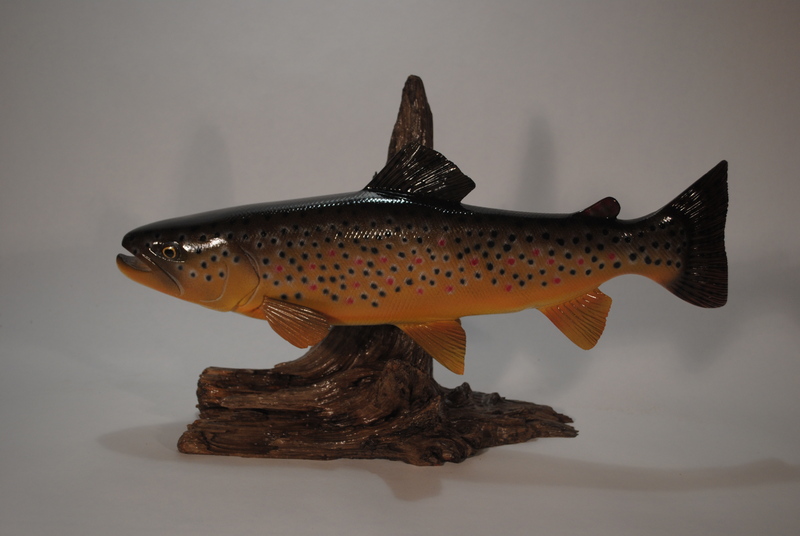 This entry was posted in Uncategorized and tagged Artisans, Bob Batchik, Fish, Fishing, Paul Young, Sunfish Woodworks, Sylvan Lake, Trout Unlimited, Wood Carving, Woodcraft. Bookmark the permalink.